Located in St. Louis City real estate, homes for sale in St. Louis Hills MO are located just minutes from downtown St. Louis and share the same zip code with a St. Louis favorite, Ted Drews Frozen Yogurt. St. Louis Hills MO Real Estate and St. Louis Hills MO properties are a perfect addition to the St. Louis Real Estate market. 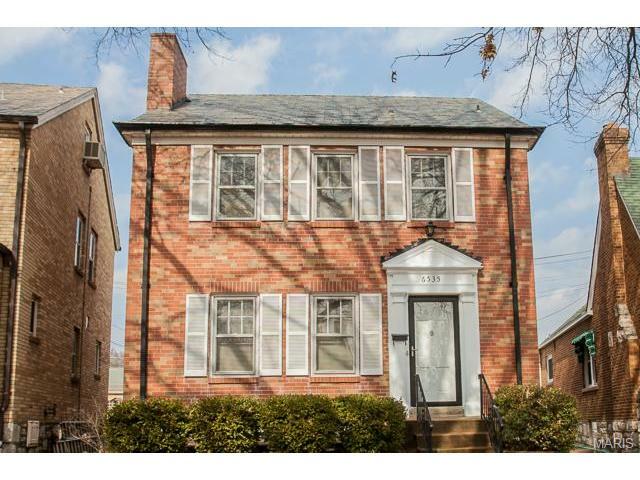 St. Louis Hills MO real estate is primarily older, brick homes. The Homes for sale in St. Louis Hills MO range in price from approximately $150,000 for smaller homes to $400,000. The median home price in 2014 was approximately $240,000. Homes in St. Louis Hills are known for their convenient location and beautiful yards. The area has a small town charm with garden clubs, two main parks and numerous churches and schools. “Country living in the City” was the phrase used to market the area in the 1930’s and still hold true today. The St. Louis Hills MO residents are served by the St. Louis City School District and also offer 9 private school choices. See Great Schools for up to date ranking on every school in the area. If you are looking for a home for sale in St. Louis Hills MO or you would be interested in buying a home in St. Louis Hills MO, please contact St Louis County real estate expert, Sharon Colona and St. Louis Realty for a professional and simple buying or selling process. Call (636) 397-7653 or email at scolona@stlouisrealty.net. ***New Construction*** This spectacular home boast a open Great Room, leading to a Kitchen, and Main Floor Laundry Room and Powder Room. xD; xA;- An Owner's Suite complete with free standing tub, enviable Walk-In-Closet. xD; xA;- A cozy home office lies right off the foyer of this Northwest house plan, allowing you to keep the family computer out of the main living area. xD; xA;- Upstairs loft presents another spot for the family computer and is ideal for homework. xD; xA;- 2nd Floor includes a Loft, a large guest en-suite, and a Jack & Jill style bathroom for the 3/4th Bedrooms. Old world elegance and modern style merge in this stunning 2 story home in St. Louis Hills. The large living room boasts gleaming hardwood floors, arched windows and wood burning fireplace as the focal point. The formal dining room is perfect for entertaining! The beautifully updated kitchen features plentiful custom cabinets, granite countertops, and stainless steel appliances. A large powder room with gorgeous stained glass windows completes this level. Upstairs the spacious master bedroom features plenty of closet space. Each of the three additional bedrooms are sizable and offer ample closet space. Two full vintage baths finish this level. The lower level offers a full bath, family room, bar and plenty of storage space. The attached two car garage, level yard, patio, roof top deck and elegant landscaping only add to the curb appeal of this home. Special financing available. Hardwood floors throughout are freshly refinished! Close to shopping, restaurants, parks, and so much more! Is this what you x2019;ve been looking for? Walkable community? Great neighbors and block parties? A LARGE main floor master bedroom? An updated kitchen with center island? A main floor family room? A finished lower level (w/bath and wet bar) for your children and friends to hang out? Patio & firepit for your friends? The lowest interest rates in 3 years? The stars are aligned on this well-loved home so don x2019;t miss out!! Just 3 blocks from beloved Francis Park where a million little things make this neighborhood one of the BEST places to live within The Lou. One block to the fabulous Buder Library and many wonderful restaurants/cafes within walking distance. Wood floors (some exposed, some covered) on main and upper floors. Kitchen was gutted and remodeled about 9 years ago. Everything about this house says x201C;FAMILY x201D; so check it out on Friday March 29! Est. 1954: Don't judge this mid-century home by only its cover... there's a whole lotta house here! This deceivingly large St. Louis Hills Estates ranch boasts over 2,000 sq ft w/an addition plus a finished LL! There's 3+ bdrms, 3 full baths in this updated home, sitting on more than 1/3 acre on a quiet cul-de-sac. This bright & inviting home offers an open, modern floorplan. The large LR which feat beautiful hdwd floors, coved ceilings & fireplace, opens to a formal DR, then a bright, updated kitchen w/granite counters, nwr shaker cabinets & appliances. Great home office w/built-ins leads to a HUGE master bdrm suite, complete w/a lrg pvt bath & sizeable walk-in closet. 2 addt'l good-sized bedrooms & an updated full bath complete the main flr. The finished LL incl a 4th sleeping space, updated full bath, & a great rec room, plus storage & laundry. Out back is a large, fenced & pvt yard w/spacious patio plus an in-ground sprinkler! Many system updates, incl new roof in 2016. A MUST SEE! Welcome to 6258 Walsh Street - a mighty big full-brick, stone and slate house with mighty big potential; lovingly maintained. Only 5 houses from Francis Park, located on one of the best streets in St. Louis Hills. First floor hosts: Main floor Bedroom and full bath with classic tile and stained glass designs, hardwood floors under the carpet, full-size Dining Room, Living Room, and a Family Room that is open to the extra large Kitchen. A Sun Room connects the deck to a well-landscaped back yard, one-car brick & slate garage and extra parking space - or this area could be used as a concrete patio. Fully fenced yard. Full walk-out basement, laundry, & extra commode. Main floor laundry available. Upstairs 3 additional large bedrooms, skylight, and another full bath - just update with your favorite colors and carpet! Original stained glass windows throughout. Abundant storage especially in the kitchen. Passing Occupancy Permit provided. Bring your dreams and make the memories. Are you ready to own the nicest house the block?Welcome home.Unmatched in style and quality,this 3 bed,3 FULL BATH gingerbread style cottage features a truly open floor plan just just 2 blocks from Francis Park!The arched front doorway leads into the LR with an abundance of character with stained glass,original hardwood floors,stone fireplace & archway leading into the stunning DR.The custom eat-in kitchen features Himalayan White Granite,Grey Soft Close Shaker Cabinetry,12x24 marbled tile floor,tile backsplash,Stainless appliances,pantry & opens into the family room.A bedroom/flex room with beautiful French doors & full bath complete the first floor.Up the stairs leads to a one-of-a-kind Master Suite with double vanities,tile shower,reading nook & Walkin Closet.The other upstairs bedroom has it's own bathroom as well!If that's not enough space already the WO basement has a 3rd living room w/ FP!A cozy sunroom, firepit,& 2 car garage highlight the exterior.Newer electric,plumbing,H&C. Beautiful rehab of a South City 2-fam complete with a 35'x23' in-ground pool. Modern floor plan with open first floor and wood burning fireplace, 4 bedrooms/2 full baths on second floor with a well apportioned master suite overlooking the pool. This home features high end wood floors, quartz counter tops, stainless appliances, new zoned HVAC, new plumbing and new electric. This is a great family oriented neighborhood with many conveniences and close to several popular restaurants. Walkability score of 68. Motivated Seller! Willing to consider all reasonable offers!Charming ranch home located in desirable St. Louis Hills. Features include a spacious living room w/fireplace, dining room, a large breakfast room and kitchen with a breakfast bar, new range and all appliances stay ( as-is condition only). Now for the icing on the cake, the rear of the home welcomes you to an extremely large great room (37 x16) with a gas fireplace, vaulted ceilings, built ins and a dry bar area. The LL features another sleeping area, full bath, a room that can be used as a work out room or office and plenty of storage. Out side you will find a large, level fenced yard and a lovely stamped patio perfect for entertaining. Let x2019;s not forget the one car attached garage and double driveway. Don x2019;t Miss this opportunity! Beautifully renovated 2 bedroom, 2 bath, mid-century, deco revival style condominium located in the prime of St. Louis Hills. This stunning unit has large open living areas, parquet flooring throughout and numerous large windows that directly face the park allowing for incredible views and an abundance of natural light. The kitchen has been tastefully updated to include granite countertops, stainless appliances, ceramic flooring and wood accented ceiling. You x2019;ll find a cozy Master Suite offering a full bath, 2 large closets and a separate dressing area with 3 additional closets including a large walk-in. Enjoy your morning coffee on the private terrace in the treetops. This unique building features a secure, elegant entrance, elevator, workout area, rooftop deck with BBQ, additional private storage areas, laundry facilities on each floor and attached parking. You x2019;ll enjoy this premium location near restaurants, shopping and all that Willmore Park has to offer. This house is the x201C;True Home Office x201D; sits on a double lot with tons of space and storage. This home is much larger than it appears with over 1,900 total living space, two laundry locations 3bedrooms and 2.5 baths. Oversized 2 car garage plus parking pad for about 5 additional cars, large shed for storing your tools and materials. Large open lower level walks out basement side with a kitchenette and less than a year old carpet. This lower lever can be its own apartment! In this prime location the possibilities are endless. Perfect for someone with alawn care, cleaning service, pool servicing, transitional living, chiropractic and many more...Come and see this one and let your investment work for you! Combine the detail of 1930 x2019;s architecture with fabulous modern updates-a style sure to impress even the pickiest of buyers! This Southampton beauty with 4 beds, 2.5 baths will please with welcoming curb appeal and an inviting floor plan! Leaded glass detail, wood floors, arched hallways, some newer windows, granite countertops, stainless steel appliances all add to the charm and warmth. Two bedrooms and a full bath on the main level. Upstairs find a master suite with a huge updated bath with jetted tub and separate shower and a fourth bedroom. LL is finished with 2 areas: imagine entertaining in this large family room with a wet bar, quartz countertops, and a flex room, possible office/sleeping area; half bath. Enjoy your days relaxing on the large 15x12 covered deck. Plenty of storage. Level, fenced lot. 4 sides brick! Situated in a central location, close to shopping. 2-10 warranty. 2 refrigerators, washer, dryer will stay. 1 car garage. Move right in and enjoy! Beautiful Gingerbread Cottage! In the heart of the growing Macklind District w/restaurants, quaint coffee shops & more; just a short drive/walk to Ted Drewes & Francis Park! The old character & charm in view upon entering, from the ornate fireplace, leaded & stained glass windows, arch doorways & most of the natural woodwork in great condition! Newer amenities abound, updated kitchen, large family room addition, a newer 2 car garage port; protect your cars from the elements, at the same time, utilize the shelter for family & neighborhood gatherings, very impressive! Includes: zoned heating & cooling, architectural shingled roof, some newer lighting fixtures, a large master bedroom on the 2nd floor w/bonus room nursery or office/den. So much xD; xA; inside as it is much larger than it looks at 2100+ sq ft...! Located in the heart of Lindenwood Park Neighborhood, this 3+bedroom/2.5 bathroom brick bungalow offers three levels of fully finished living space! Much of the original character has been preserved--hardwood flooring, woodwork, light fixtures & stained glass windows--and the addition of some sleek updates has combined classic w/ modern for a perfectly balanced ambiance. The stylishly renovated kitchen boasts granite countertops, stainless steel appliances, ceramic tile flooring & a large pantry. Just off the kitchen is a fully enclosed sun room/porch that leads out to the spacious yard, patio & 1 car garage. The finished, walk-out lower level offers a large rec room, a full bathroom & a bar area making it the perfect space for entertaining guests. Upstairs you will find a full bedroom with 2 large closets, a half bathroom & a possible 4th bedroom/sleeping area that could also be used as an office or a play room. Wonderful location near highways, great restaurants, gyms & shops.